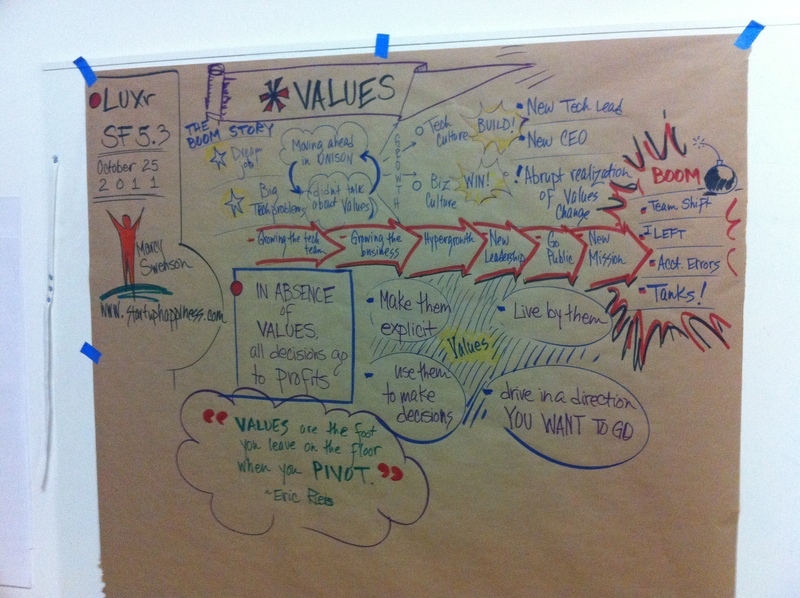 Today I hosted a workshop for LUXr about company values, and Kate Rutter did an amazing job taking visual notes (above). LUXr is a wonderful 10-week program for startup teams, where they learn lean startup methodologies + design/user experience best practices from Janice Fraser, Kate Rutter, Lane Halley, and Josh Seiden. Dale and I frequently & enthusiastically recommend them to clients (and we offer a discount that allow teams to do LUXr + coaching simultaneously). A team who is consistently living by their values creates a certain tone and resonance; things feel consistent, and it’s easier to speak up when things don’t fit. When a team either doesn’t have values, or worse yet, has a stated set of values but isn’t living by them, there is a sense of dissonance. What the team says they’re doing and what they are actually doing don’t match, and it feels awful. The company vision is a snapshot of a possible future that you and your team hold in your mind’s eye as you doggedly undertake the journey, with all of it’s twists and turns. Values dictate how you and your team will BE on the way to get there. As Steve Jobs famously said “the journey is the reward” — there is no guarantee that you’ll arrive at the place you set out for, but you have a surprising amount of control of how you conduct yourself on the way there. And in the absence of explicit values, a company will generally gravitate toward making as much profit as possible. It’s how the public markets are structured, and how lots of businesspeople have been taught to think. I love the idea of companies that are wildly successful and profitable, but I wouldn’t want to work at a company that was only about money. Making your values explicit up front is the best way I know to create a company that’s about more than just profit. Thanks for the amazing day of learning Marcy. We made some great advancements with your help! Mike, so glad you and your team enjoyed it; I’d love to hear what you all learned! Well said. Goal of any business is higher than money. Money should be the fuel to drive to the goal. Even a service driven company like us http://www.idyllic-software.com has a higher goal of creating a company which is a platform for growth to its associates and energy drives add value to its clients.